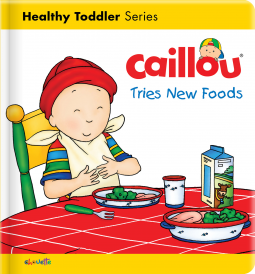 For young eaters; Caillou Tries New Foods – Joyce's mystery and fiction book reviews with some non-fiction too! This is a read-aloud for a young and fussy eater or for parents who do not want to find themselves with one! Caillou’s mom finds a good way to encourage Caillou to eat a healthy dinner. Children who know Caillou from other books or from TV will enjoy this story. ← For young Reading Stars; If I Had a Dog by O’Neill. This was so me as a kid! I refused to eat anything unique or different! I remember when I was four or five my mom tried to get me to eat mushrooms (which aren’t even that weird of food) and I refused. It’s ironic, since now I love trying the weirdest foods. This book is incredibly important, because I feel like a lot of kids are really picky, sometimes negative to their health. A younger brother of one of my friends refuses to eat anything but pizza and MacDonalds. That cannot be good for him! I think that food is one of the places where kids first realize that they can exercise their will. As Caillou’s mom knew, fighting does not help but engaging a child does. Glad to know that you enjoy more foods now! Thanks for following and commenting.